Will you tell us a little bit about Mediplay? 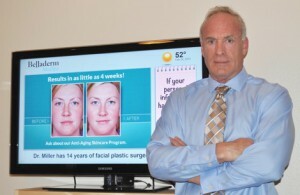 Mediplay was founded in 2004 by Dr. William LeLiever, an ENT physician and his son, Jamie LeLiever. Dr. LeLiever was looking for a way to better inform his patients on the wide range of services that his practice offered. What started out as a locked down 20 min. DVD loop, has turned into a robust networked solution that now provides physicians and their staff with all the tools they need to inform, educate and motivate their patients.Over the years our in-house animators have created over 600 medical videos covering 23 different specialties, each of which is presented to the patient in a very informative, yet easy to understand format. Combine this video library with the ability to create custom content in minutes, and practices are finding that it is possible to implement Mediplay within days of placing the order. There isn’t any heavy equipment to install and they can use their existing HDTV. It really couldn’t be much easier. What is your personal background? How and when did you get into digital signage? I’ve had several businesses. The last one I had was a natural candle company called Aroma Naturals. I started making natural scented candles with pure essential oils in the kitchen in 1996 and grew it to be a large player in the candle business. Yankee Candle Company bought the company in 2005. I retired in Laguna Beach and kept my eyes and ears open for something interesting and fell in love with Mediplay.I was initially introduced to Mediplay as an investment. In 2011, after spending some time at Mediplay, I bought a majority stake and jumped right back into the CEO role again. The concept of an ad-free digital signage solution in a doctor’s waiting area was unique and refreshing, so I changed the ad-based business model, to an ad-free one. What particularly enticed you into the healthcare vertical? Mediplay was founded by an ENT physician so we have always been involved in the medical vertical. Although at the moment, Mediplay is exclusively in healthcare facilities, the system could easily be used in any vertical because of the flexibility we have created with our online management platform. Your system uses any basic television set rather than specifically designed digital screens. What do you see as the advantage of that? Are there any disadvantages? Practices often already have a TV in their waiting room showing either daytime TV or a DVD loop. By simply hooking up our small media player to that existing screen, they have an in-office digital signage network without a huge outlay of cash. Consumer screens are more than adequate for the hours of use and the environment where Mediplay is installed. You claim not to accept advertising, yet I’ve noticed that specific medical services such as hearing aids, dental veneer work, etc., are promoted but not by specific brand. Do you not see this as advertising? Please explain. Mediplay is a subscription-based service. We don’t rely on selling ad space for revenue and, instead, give total control to the client. Anything that is ‘advertised’ on the screens in a particular practice was scheduled by that practice and benefits them. If they offer hearing aids, then they can advertise that. If they offer teeth whitening then they can advertise that. 100% of the content enhances their marketing efforts and builds their business. You have 700 videos ready for use by members of your network. Where do/did you get them, and do you constantly update them or add more? We have a few different video libraries available for our clients. Our medical topic library consists of over 600 medical videos, all produced in-house. They come in two different versions, one with narrated voiceover and one silent with text. We check and update all medical topic videos on an annual basis to keep up with changes in treatments and procedures. We also produce videos as our clients inform us of new treatments.The second library available is a manufacturers library consisting of over 100 brand specific videos covering a certain product or procedure. These videos are produced by the manufacturer and then provided to Mediplay. Further, a library of third-party entertainment videos provides a great change of pace, allowing clients to insert fun and exciting videos into their programming.Subscribers are also able to upload their own videos to a private library. Each client can upload as many videos as they like and schedule them to their screens as needed. For practices with a strong presence on YouTube or similar, Mediplay provides a great opportunity to share these videos with their waiting patients. I noticed that you claim sales increases for the services by the network clients. Can you give up a couple of examples? How do you obtain figures? What kind of measurement system do you use? How do you get your entertainment videos, which must be difficult to keep up-to-date? It appears you have a deal with National Geographic. Who else do you partner with? And how much of the screen time is generally devoted to entertainment? We do license entertainment videos from National Geographic. As with all our content, each video is selected by the practice only if they see it as a benefit to their practice. Medical topic videos and product videos are the most popular but entertainment videos are available for those practices that have longer wait times and prefer to have a variety of different content. If you have a new addition to your network, does that health office choose everything that goes on their screen? How is it usually decided? Each client has access to all of our libraries. Each video can be previewed before they schedule it to their screens. We see different methods of how practices choose videos and create their programs. Some practices are very targeted in their marketing and education and will focus their program on generating awareness of certain products and services that their patients may not know they offer. Some design their program around their monthly specials and things that they are promoting at that time. Others employ a ‘shotgun’ style and select content covering the full range of services that the practice offers. What percentage of your clients do creative content for their screens? What kind of content do they add? All of our clients are creating their own content using the templates available within our online portal or uploading something that has been created outside of Mediplay, in applications such as in Photoshop or Powerpoint. A very popular template is the before & after template, which is used quite a bit by plastic surgery and dermatology practices. Another popular template is the provider bio template. We have over a dozen different templates in a variety of themes to cover any need.Our video upload feature is widely used as well. Clients who have invested time and money in producing their own videos are excited to be able to show them in their waiting room and not just have them sitting unwatched on their website.We offer a content creation service at an additional charge, but very few of our clients use this because we have made it so simple for them to do it themselves. Are all your networks lumped together, or do you separate them according to eg. pediatricians, cardiologists, etc.? From what sectors do you draw the largest group? And the smallest? Each individual practice or medical organization is considered a network. Separation isn’t necessary in our business model since we are not selling ads to agencies only interested in a certain demographic.Since our company founder is an ENT physician, we have a large footprint in that speciality. While at the moment we are seeing lots of new business from the aesthetic markets, all areas of the medical community are finding that Mediplay is a valuable tool that enhances their marketing efforts and improves the overall patient experience.The sector that we haven’t seen significant adoption of technology like ours is Pediatrics. We do not currently offer content designed for children, so they tend to stick with a DVD player showing cartoons or similar. How many screens do you have in total? And, without advertising, how is the network supported? Currently, we have over 300 networks, ranging in size from 1 to 45 screens each. We charge a monthly subscription fee for our service. This produces a predictable, stable monthly income compared to a network that depends on unpredictable ad revenue. We have designed such a user-friendly interface that little manpower is needed to support all of our clients. When it is needed, our customer support is stellar and often praised by our clients. What software content management company do you use, and why? Even prior to the creation of Mediplay Connect, our network was managed through Broadsign. Beyond the great functionality provided by Broadsign’s content management system, we found its team to be extremely easy to work with. Our network configuration is unlike most that it supports, yet it was able to adapt to our needs.Soon after moving to Broadsign we began developing Mediplay Connect, which takes advantage of Broadsign’s Open API. Prior to Mediplay Connect all changes across the network were processed manually, upon request. With the creation of Mediplay Connect, clients are able to make scheduling changes without reaching out to Mediplay. This allowed our internal staff to concentrate on supporting the network and improving the functionality, while also providing full control to the client. I notice that you also offer music as background? Does that mean that all your messages are silent? And how is the music chosen? Some videos have sound and some don’t. If a practice chooses background music it will play when a silent video or custom piece is on the screen, but will mute if a video has sound. A client can choose from six different genres: Classical, Easy Listening/Relaxing, Jazz, Lounge, Pop/Alternative Rock and Zen. All can be previewed and selected through our online portal, Mediplay Connect. There are numerous other major networks in the healthcare sector in the US. What do you see as Mediplay’s major advantages over them? Do you foresee possible mergers or acquisitions with any of them in the next couple of years? Our ad-free model and the fact that all content is created or selected by the client is what sets us apart from the rest.Also, the vast library of video content that each client has access to is something that none of our competition offers. There are many digital signage platforms out there but they don’t offer any content – and the burden of producing content is both expensive and time-consuming. We provide ready-to-use content that is specific to each specialty which makes it easy for an organization to quickly get a professional-looking program on their screens.Another major difference is that we are not ‘one size fits all’. Many networks pipe the same program to everyone and only allow for a fraction of the screen time to be used by the practice. The question of a possible merger has not come up because we are fundamentally different in our business model compared to most networks. The healthcare market is large and just waking up to the idea of digital signage. So while our platform can easily be used in commercial and retail environments, we plan to continue serving the healthcare community.We have aligned ourselves with some well known GPOs and marketing companies that serve various medical verticals and we are exhibiting at trade shows associated with medical conferences.We are experiencing a good bit of growth organically through word of mouth and from doctors or administrators seeing Mediplay live in a waiting room and wanting it for their practice. Often a medical product representative will see Mediplay in a waiting room and ‘the nickel drops’ and they see how having their product’s information on the TV could benefit both them and the doctor and they sponsor a system for that practice. Who owns Mediplay? Are you looking for outside investment? Why or why not? The majority of Mediplay stock is owned by the officers in the company. We are currently not actively looking for outside investors. However, we would welcome a strategic partner in order to grow at a faster clip. The hardest part is done and that was building a solid platform with incredible functionality, while at the same time being user friendly. What sectors of the digital out-of-home industry do you see as major growth areas in the future? I can only speak from the feedback that I hear from clients and that is that people are getting worn out from irrelevant outside advertisements The same as we see with a service like Netflix, users are willing to pay a small fee to avoid unnecessary advertisements. Mediplay’s ad-free business model is here to stay. How do you foresee Mediplay in the next few years? We hope to continue helping practices and other businesses convert from traditional digital signage that promote other interests and to shift the focus to grow and promote their own business. The healthcare vertical is a very large market and we have just begun to penetrate it. We know that market very well and for now all of our content is designed for that vertical.But we know that the platform we have created can easily be re-branded, so it is certainly possible that we step outside of healthcare in the future. This entry was posted on Friday, March 27th, 2015 at 13:03 @586 and is filed under CEO SPOTLIGHT. You can follow any responses to this entry through the RSS 2.0 feed. You can leave a response, or trackback from your own site.